Ginger Is At It Again! Why are all slightly unbalanced Cats called ‘Ginger?’ If you read my blog or visit my www – wickedly wonderful website here www.thecatsdiary.com you’ll be more than familiar with one of my best pals who mostly goes by the name of ‘Ginger,’ and indeed you may remember vividly his ‘cooler kid’ story. My pal Ginger is not the only Ginger Cat who’s ‘balance’ you would question, but it doesn’t end there, ‘Ginger’ Cats are more often than not just plain naughty which is yet another trait in the shadowy, larcenous end of the Cat family tree where the ‘Gingers’ hang out doing a marvellous job of finding trouble. The reason I ask why all Ginger Cats are ‘the way they are’ is because yet another Ginger has been caught being naughty, generally annoying folk and in the process getting himself into all sorts of official tepid water. ‘Welsh Ginger’ has a hobby! It’s the sort of hobby that he and other enthusiasts can only practice at night when few are about and all good humans and nice Cats are tucked up in bed fast asleep. ‘Welsh Ginger’ went to far this time though when his human was woken up by Police officers urgently banging on the front door in the very dark and early hours of the morning. ‘Welsh Ginger’s’ sleepy, bleary eyed owner was told by the Police that they were responding to a ‘999’ call it is the same as a ‘911’ call except that it is faster and easier to dial on a digital phone obviously – mind you this Cat has always wondered why humans didn’t pick the first number on the phone dial to jab three times in a hurry if there was a need for any or all of the emergency services? But then that has nothing to do with this story or indeed human logic! ‘Welsh Ginger’s’ human sleepily said that the emergency call was nothing to do with him and took the officers into the front room where he kept the phone to prove it! It was then that ‘Welsh Ginger’ might have known that the game was ‘up.’ well at least for the moment, if he had been awake! Unfortunately for ‘Welsh Ginger’ he had dialed 999 to make the hoax call probably giggling sleepily and then nodded off next to the phone where he was, according to the police report, “found to be reclining next to the unhooked phone with one of his paws on the keyboard.” Oops! 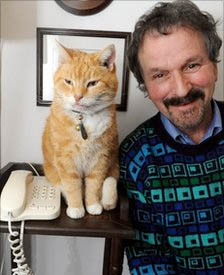 When we at The Cat’s Diary had a chat with – let’s call him ‘Telephone Ginger,’ because for some reason ‘Welsh Ginger’ make him sound a bit dim doesn’t it, he said. ‘Telephone Ginger’ went on to say that he liked not only playing with the phone but also making hoax calls but that it seems that he had made one or two fatal errors. This clever Cat never said that Ginger Cats were that bright did I?